Assigning a fill or stroke color to graphics is relatively simple in Fireworks Creative Suite 5 using the Swatches panel. But what if the color you want to use isn’t in the default Swatches panel? In that case, you need to create a color and add it to the panel. You can accomplish this task using the Eyedropper tool and the Color Palette panel. The Eyedropper tool is useful when you have a color to sample. Just select the tool, click any color (in your working document or in any other open Fireworks document), and then choose Window→Swatches. When the Swatches panel pops up, click an empty area, and your sample color is added. 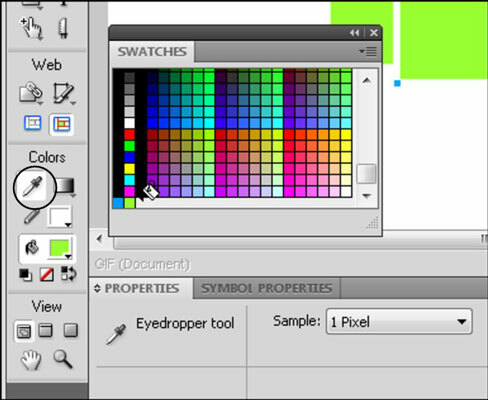 Select a color with the Eyedropper tool and then click the Swatches panel to save the color. To remove a color from the Swatches panel, position the mouse pointer over the color you want to delete and press Ctrl+Alt (Windows) or Ô+Option (Mac). When the scissors pointer appears, click the mouse; the color is deleted. The color palette is a dynamic and fun way to set color. Each of its three tabs offers the opportunity to choose a stroke or fill color and a different method of selecting that color. You can open the Color palette by choosing Windows→Others→Color Palette. Selector: The Selector tab lets you pick a color in any of four color models: HLS (hue, lightness, saturation), HSV, CMYK, and RGB. Click the large color panel and then enter color values by using the sliders or text boxes at the bottom. 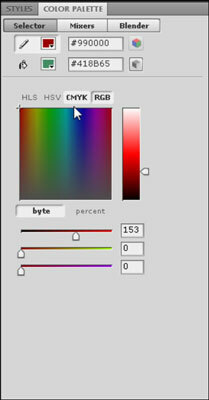 To adjust the tonal value, use the slider to the right of the large color panel. Mixers: The Mixers tab lets you assign multiple colors by using the color wheel. You can also create a tint build at the bottom of the window so that you can build combinations of colors. In addition, you can export the colors as a bitmap or a table using the Export buttons on the left side of the Mixer tab, which makes it easy to reference them later. Blender: The Blender tab lets you select two colors and then view and choose combinations of those colors. To blend colors, enter two color values in the text boxes at the bottom of the Blender tab and then use the slider to view various combinations of the two selected colors.